Puspanjali Dance is one of the new creations, created in 1989 by dance artist N.L.N. Swasthi Wijaya Bandem and collaborated with I Nyoman Windha as the musical accompaniment. Puspanjali is derived from the word "puspa" (means: blossom, politeness) and "anjali" (means: salutation, reverence). It has a meaning of reverence with courtesy. The dance is performed as a welcome dance to respect important guests and as a beautiful secular dance (balih-balihan). 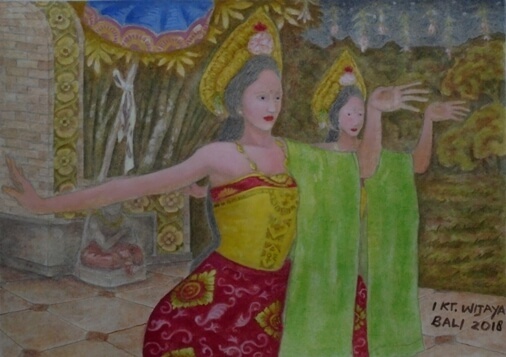 This Balinese dance is classified as a group dance, performed by 5-7 female dancers. The dance movements are soft, swift and dynamic, also full of smile and beauty. Puspanjali takes a lot of inspiration from Rejang Dance, a special dance performed during religious ceremonies of Hindus in Bali to honor the God. This dance has a dance structure consisting of: Pepeson, Pengawak, Pengecet, and Pekaad. Pepeson is the beginning of a dance. Pengawak is a part of the composition that shows the dance movements with slow tempo. Pengecet is a part of the composition that features moderate to high dance movements. Pekaad is a part of the composition marked by fast dance movements and then slowly to end the dance. In dance performances, the costume and makeup are really important that can bring up certain characters depicted in the dance. The hair is styled (sasak) along with a hair piece (antol) which is mounted on the back head. The dancer choosing the right makeup and then completed with ornaments such as: gonjer flower, gold clover flower, fresh flowers, badong, and subeng (earrings). The torso is wrapped using a bodice cloth with gold motif (called ankin) and a sash. The lower half of the body is wrapped using Tapih (an under cloth), which extends up to the ankles. The Tapih is layered again using patterned cloth, and the tip is left hanging. Puspanjali dance is mentioned to have a simple but beautiful motion pattern. The dance also has a short duration, less than 5 minutes. Many children and female dancers are interested in learning the dance.